Hallux rigidus is essentially a progressive arthritis, leading to stiffness and pain in the big toe joints [Figure 1A -1st MTP joint]. The loss of joint cartilage, which occurs first along the top half of this joint, is believed to result from changes in joint dynamics that lead to increased pressure across the joint as the toe bends upward. This can take many years to develop, but can become quite symptomatic. In the later stages of this disease process, cartilage covering the remainder of the joint surface also erodes, leading to a progressively worse and more bothersome arthritic joint. Patients with hallux rigidus will typically present with pain, stiffness, and swelling in the great toe joint. This is aggravated by activities that involve excessive, repetitive upward movement of the big toe joint, such as prolonged walking. Swelling usually occurs along the top half of the joint, and will be frequently associated with bone spur formation, recognized as a “new prominence” by the patient (See Figure 1B). As the condition progresses, patients often compensate by putting more weight on the outside of the foot as they walk. 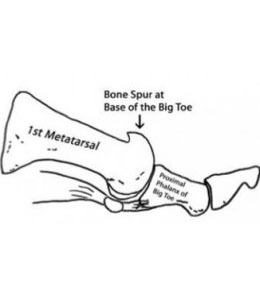 This may cause pain in the forefoot (metatarsalgia). 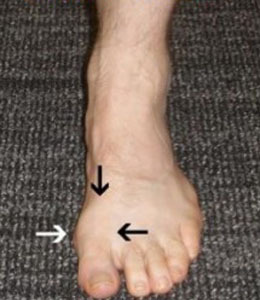 Physical examination will reveal limited and often painful motion in the big toe joint, particularly when the patient is weightbearing (See Figure #2). Prominent bone spurs [osteophytes] on the top part [dorsal aspect] of the joint are usually visible and palpable. It is very common to see these findings in both feet, although usually one foot is more symptomatic than the other. Tenderness to touch is common over the swollen great toe joint. 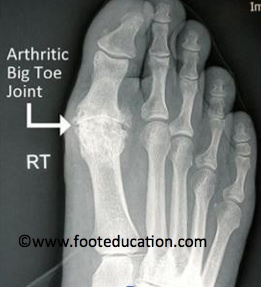 Weightbearing foot x-rays will typically identify some loss of first MTP joint cartilage, seen as narrowing of this space on the x-ray – as compared to other similar spaces seen in nearby unaffected joints. There may be squaring of the metatarsal head on the anterior and posterior view. The lateral view will often show a prominent dorsal bone spur (See Figure 3). Limiting great toe motion. The pain associated with movement of this joint can be limited with the use of a stiff-soled shoe, with a slight rocker bottom contour. Alternatively, a rigid shank can be applied to the shoe, a foot plate may be inserted under the orthotic, or an orthotic with a Morton’s extension (a.k.a. “Turf Toe Plate”) can be used. Each of these serve to decrease or eliminate the painful motion of this great toe joint, when affected by hallux rigidus. Anti-inflammatory medication. The use of an over the counter anti-inflammatory may also be helpful in improving symptoms.